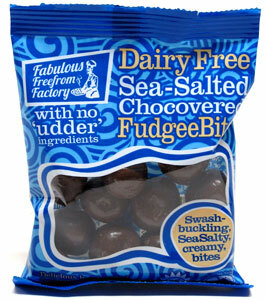 A unique vegan treat we haven't seen before, this sweet and tasty indulgence combines sea salt, vanilla fudge, and chocolate into one awesome snack! 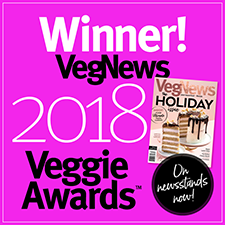 Fabulous Freefrom Factory has come up with their twist on classic treats that's made with dairy-free vegan chocolate and vegetable-based glaze to give you the awesome pairing of this flavor trio without any of the animal-based ingredients you want to avoid. 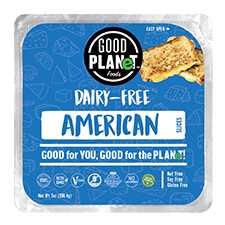 Plus, they're free from gluten as well as dairy, making them safe for those with allergies, and they're also free from hydrogenated fats, artificial colors and preservatives, and all the other junk you don't want in your snacks! Imported from England. 65g (2.3 oz.) packs are $3.99 each. From Lauren Andalora of Salt Lake City, Utah on 11/4/2018 . I bought $60 worth of chocolate for my boyfriend's birthday. They are not really what we expected. They taste like brown sugar/caramel and have like a "dry" texture because they are so sugary. From eggplant of vineland, New Jersey on 10/5/2018 . good vegan candy is hard to find (for me anyway.) i completely agree with the previous review. the inside has sort of a mapley flavor and a nice texture. i was afraid of the salt, but it’s not too much, like some chocolate lately.........seems they’ve all gone crazy putting salt in chocolate and sometimes it’s just overwhelming and gross. these are perfect. i also love this brand’s chocolate covered raisins and peanuts. also, i prefer milk chocolate over dark, and to me, these are a nice, creamy “milky/dark combo and definitely not bitter or too dark tasting. perfect! From Jen Gagnon of Grass Valley, California on 2/10/2018 . Whoa! These are amazing! They're so rich and creamy. I wasn't sure what to expect. The flavor is almost mapley or brown sugar, very rich, with bits of salt that really bring out the flavors in the fudge bits. I am going to stock up on these and then force myself not to eat a whole bag in one go and that's going to be difficult because these are fantastic. What a treat!